NOTE - SQUEEZE will only work on an 'expanded' Z88. You must have at least a 128 K RAM pack (or more) in slot 1. SQUEEZE has been designed to help you utilise your Z88's memory more efficiently. Anyone who uses their Z88 will know that memory is a fairly scarce resource and SQUEEZE will make it go much further. It does this by allowing you to compress files so that they take up less memory while you are not actually working on them. Once they are compressed they can be stored in Ram, Eprom, Disk or on your desk-top computer in that format, taking up around half the space that they would normally occupy. SQUEEZE has a password facility which will enable you to scramble a squeezed file so that no prying eyes will be able to read it unless they know the password. This makes SQUEEZE essential if you store confidential material on your Z88. SQUEEZE is compatible with squeeze programs for the PC. Full compatibility means that you can squeeze a file on your Z88, send it across to your PC and unsqueeze it there. You can of course do it the other way round as well. Sending squeezed files across the link also cuts down the time it takes to transfer files between PC and Z88. The Copy facility enables you to move files around your filing system and/or make duplicate copies of files in different devices or directories, much easier than you can with the Filer's Copy or Tree Copy commands. This allows you to see what is in a file without loading it into an application. Either select it from the applications menu in -INDEX- or type n U. When entering SQUEEZE for the first time you will be asked whether you want to store your squeezed. files in a directory called Squeeze on the default device (whatever that is set to on the Panel). You can choose another device (tJ will show you the options available) or another name for the directory that SQUEEZE will create by editing the name on the display. If you leave the name as Squeeze, it will put that directory in the Squeeze window but if you have used another name you will have to type the name in every time you load SQUEEZE as a suspended activity. If you leave Squeeze as a suspended activity, it will remember the directory name you told it to use. Press the -INDEX- Key (the -ESC- key will not leave the SQUEEZE application). You will find three windows on the screen. The one on the left holds the command menu. The middle one initially holds the Z88 default directory (normally the top level or 'root' directory) on the default device as set in the Panel - you can change it from within SQUEEZE if you need to. The window on the right shows a special sub-directory which SQUEEZE creates the first time you enter the application. The device and/or directory names will be shown in the reverse colour panel at the top of each window. The two larger windows enable, you to see files in the directories that you have selected. You can select the directory in the middle window with the Select Z88 Directory command. The Select SQZ Directory command allows you to move any directory on your Z88 into the right hand window - it doesn't have to be the Squeeze directory. The SQUEEZE application will only operate on files in the directories shown in the windows so you must select the directories you want to work with before you start. While the cursor is either in the Z88 or the Squeeze directory window, moving it to the top and then pressing the ñ again - will display the total number of files and directories in that directory on the bottom line of the window. When a file is squeezed, another copy of the file is created, squeezed and then saved. When you catalogue either version of the file they will not have the same dates on them, because they were saved on different dates and times. To use any of the commands that will effect files you must first move the cursor into the correct window and mark the files you want to work with. To mark all the files in that directory press the tkey followed by -ENTER-. If there are one or two files that you don't want to work with in those that you have just marked, move over them with the cursor and press the -TAB- key. The marking triangle will then be removed from that file. This is often much faster than marking all the files you want individually. If you don't mark any files you will be asked to type in the name of the file you want to work with at the 'source' prompt. When you press -ENTER- the same name will be put in against the 'destination' prompt. You can change the filename here by putting the new name after the destination prompt. sending a file to be unsqueezed on another computer for the first time. To make sure that you can get the file back to its original form unsqueeze it immediately. You can then squeeze it again and delete the original file. Carry out the same procedure on files that contain really important information just to check that you can unsqueeze the file successfully before throwing away the original copy. 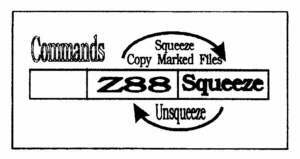 You should always have back-up copies of all important Z88 files to avoid - disasters this is equally true for squeezed files. A password can be up to eight characters long (using any of the visible characters available on the Z88) in upper or lower case. When you select password protection you will be warned that the facility is case sensitive. This means that not only must you type in the exact characters that you originally used for the password when unsqueezing a password protected file, you must also put them in the right case as well. For example if you used 'Quack' as your password and you typed in 'quack' to gain access to your protected file, SQUEEZE would not accept that as the correct password. Please note; if you forget your password you will lose access to all files that you were protecting with it. So although it is possible to have a different password for every file, we recommend that you stick to just one or two that you are likely to remember! If you want to have several passwords we suggest you store all files with the same password in a separate sub-directory. A file that is protected by a password is not PC/DOS compatible. You can store it on a PC, but you can't unsqueeze it there. The bigger the file the more memory SQUEEZE will save for you. If you try squeezing smaller files you may find that the reverse is true, a file under 2'K' long may actually be bigger after it has been squeezed. This happens because SQUEEZE organises the characters in a totally different way to those in a normal file. Depending on the frequency of use, each character is given a different value and a table of those values is added to the beginning of the file so that it can be unsqueezed successfully. Because of the vast savings in memory the small amount of additional memory the table takes up does not normally matter. If, however, you are squeezing a file that is 2 'K' long or under, the table may make the squeezed file bigger than its unsqueezed version. A similar thing will happen if you squeeze an already squeezed file. If the file is 511 bytes or less SQUEEZE will not normally bother to squeeze it but will just copy it over into the Squeeze directory as it is. If, however, you ask for Password Protection on a file SQUEEZE will always squeeze it (and possibly make it bigger). If you are using SQUEEZE to save memory don't squeeze small files. But if you are using SQUEEZE for its security benefits and have plenty of memory it will not matter how big (or small) the file may become. When a file is squeezed SQUEEZE will encode the filename, date and time that file was last saved. If you catalogue the file immediately after unsqueezing it you will see two dates and times, the date/time that the file had been saved before it was squeezed together with the date/time that it was unsqueezed. Once you have saved the file again the two dates will revert to showing just the date/time that you saved the file. There is a limitation on the dates available to be compatible with PCs. But since valid dates range from the 1st January 1980 through to the 31st December 2043 it's not likely to be a problem. If you squeeze the file elsewhere with a program that does not encode the time and date, and then unsqueeze it on your Z88, the Filer will give it the first date it knows about, midnight 27th September 4000 B.C. To avoid getting squeezed files and unsqueezed files muddled up it is a good idea to keep squeezed files in a separate directory from unsqueezed ones. SQUEEZE helps you do this by creating a new directory to store squeezed files in. But because you can select the Device and Directory that you want in the third (squeeze directory) window you can store squeezed files anywhere in your filing system. If you want to further separate squeezed files you can create sub-directories within the Squeeze directory but you have to do that from the Filer rather from within than SQUEEZE itself. Maximum filename length for the Z88 is twelve characters plus an extension but on a PC or compatible you can only make filenames eight character long plus the extension. When you squeeze a file that has a name longer than eight letters SQUEEZE will warn you that the name is not compatible with DOS. You have two options here: you can either ask it to make the filename DOS valid for you, in which case it will just use the first eight letters as the filename or, you can press -ESC-, go into the Filer and rename the file with a meaningful filename yourself. If the file is going to stay on the Z88 you can ignore the warning and carry on with the Squeeze by selecting 'No'. To identify which files are squeezed SQUEEZE puts a '.ZSQ extension on the end of the filename if you are not using filename extensions. If you have used an extension Squeeze will change the second letter to a 'Q'. It is advisable not to use 'Q' anywhere in a filename extension from now on and change any that you have already used. Because different computers have differing rules about which characters you can and can't use in filenames it is possible that you may use characters on one machine that the other cannot handle. If this incompatibility arises in a file that you have squeezed on one machine and unsqueezed on the Z88. SQUEEZE will substitute any offending characters with a minus character. Once a file is squeezed you cannot view it or work with whatever it contains until it has been unsqueezed again. If you do try and load a file into an application in its squeezed form you could be sorry! The very least that could happen is that you will see the raw coded version of the file which you will not be able to read. The worst and much more likely possibility is that the coded version of the file will contain numbers that mean something to the 288 even though they are not meant to. They could cause the file to be corrupted and lost, or the Z88 to crash. This would force you to do a hard reset and lose all files in your Z88. Squeezed and Unsqueezed Files with the Same Name? If there is already a squeezed file with the same name as the one you are going to squeeze you will be asked whether you want the current one to overwrite the older version. If you type 'n' for no that squeeze will be abandoned. The same is also true the other way round. If there is an unsqueezed file with the same name as the squeezed file, when you unsqueeze it you will be given the option to overwrite - if you select 'no' unsqueeze will be abandoned. Because the name of the file is encoded, if you change the name of that file in the Filer, when you unsqueeze it, it will revert to its original name. You can however, rename a squeezed file by unsqueezing it on its own. If you select the unsqueeze command, without marking any files in the windows, you will be given the source and destinations prompts. This enables you to put in the existing filename as the source and the new name that you want the file called as the destination. You must have enough space in RAM for both the squeezed/unsqueezed version of the file. SQUEEZE will check the availability of memory: if there isn't enough space it will tell you there is no room, stop and delete the file that it has just created. You will have to clear some space or move to a different device before trying to squeeze/unsqueeze it again. Using the 'delete source file' option while you are squeezing or unsqueezing will help if you are short of memory but don't use it unless you have a back-up copy of the file stored elsewhere to cover you in case of disasters. The authors of SQUEEZE have gone further than the authors of Oz (the Z88's operating system) and made the Sound option in the 'Panel' do something useful. Within the built-in applications, all the Sound option does if you set it to 'no' is stop the Alarm beeping when it reaches its allotted time. But if you run SQUEEZE with Sound set to 'no' on the Panel the SQUEEZE sound system is turned off so you no longer hear the multitude of 'beeps' that normally come out of the loudspeaker. SQUEEZE has all its short form commands on a single menu page which you display by pressing the -MENU- key. The catalogue SQZ and Z88 Window commands function in exactly the same way as the catalogue commands in the Filer. They will give you a list of the files in the selected window with the time and date of when they were saved and unsqueezed. The catalogue list will also show you the size of the files so you will be able to see how much a file has been squeezed by. These work in exactly the same way as the Select Directory and Device commands in the Filer. As with the Filer from within SQUEEZE you can move around between directories by pressing -SHIFT- and ò or ñ after selecting the directory name or window with the cursor where necessary. If there are 'no files' in a directory, a 'PARENT DIRECTORY' entry will be shown in that window when the cursor is moved inside. This entry just allows you to select that directory by entering the window and using the -SHIFT- ñ keys. The only difference to the commands in the Filer and the ones in SQUEEZE is with the Select Device Commands. When you get the 'name' prompt you can get to the device you want by repeated pressings of tJ instead of typing in the name yourself. Before using these make sure the windows are showing the correct directories and either mark the files or enter the filename manually. Then select the Squeeze or Unsqueeze command and press the -ENTER- key or edit the filenames. The display will tell you what the program is doing. It has to analyse the file first, then squeeze or unsqueeze it and finally save it to RAM in its new form. This allows you to remind yourself what is in a particular unsqueezed file in the Z88 window. The file may not look quite as it did when you were working with it in the application. For example in PipeDream you will see the percentage characters that are used to store layout instructions as well as the text but you should be able to see the text quite clearly. You cannot alter the contents of the file in any way from here, all you can do is look at it. Copy enables you to send a duplicate copy of a file or number of files from the device/directory in one window to the device/directory in the other in exactly the same way as you would if you were squeezing but without the size being changed. This means that you can move files, between directories for example, very easily. To copy a file the procedure is exactly the same as for squeezing. Get the right directories in the windows (the directory where the file is in the Z88 window and the directory where you want the file to go in the Squeeze window), mark the file(s) you want to copy and then select the Copy command. You will then be asked if you want to delete the Source file - this will effectively move the file from one place to another if you select 'yes'. You must put the cursor in the correct window and/or mark SQUEEZE what you want to do. You can mark all files in a window with t-ENTER- Mark or unmark individual files with the -TAB- key. Always KILL the Squeezed application before taking the ROM out of the Z88 Don't load a squeezed file into an application. This either means the directory isn't there or it means you have typed the directory name incorrectly. Check with the Filer to see that it is there and how you spelt it and try again. You have pressed the -ESC- key and stopped whatever SQUEEZE was doing. The file SQUEEZE was creating would be deleted and the original file will be left intact. You will have to start again. The file you have asked SQUEEZE to save is already being used by another application. Go into the -INDEX-, check your suspended activities, make sure you saved the file to RAM when you left it and then KILL that activity. You will then be able to go back and work with the file in SQUEEZE. Alternatively the file has been hit by the 'File in Use' bug. The only way of clearing this is with a soft reset. SQUEEZE has not quite finished whatever it was doing and needs a bit more time to tidy up before it goes on to do something else. You have run out of memory in the RAM that you asked SQUEEZE to use. Choose another RAM or clear some room by deleting or moving some files. Unless you have a file that is filled with 64 'K of just one character SQUEEZE will handle files up to 192 'K. Change the extension so that Q is not included. You have either got the wrong password or you have typed some of it wrong, try again. You have asked SQUEEZE to unsqueeze a file that isn't squeezed. If you get this error with a text file it may not be too drastic. It will usually mean that just one or two characters are wrong. You should still be able to load the file into PipeDream, find the incorrect characters and put the problem right. If this error appears on a BASIC program file or any other type of file that has hidden codes you may not be able to see where the problem is and may therefore lose the file. WARNING! DO NOT TRY AND RUN A BASIC PROGRAM THAT HAS ONE OF THESE ERRORS IN IT. THEY COULD CAUSE THE Z88 TO CRASH. Unexpected End of File - File Corruption? For a text file this message does not necessarily mean that you have lost it completely. You may have just lost something off the end of the file. It might be as trivial as the last letter or the last word. But whatever you have lost, you should still be able to load the file into PipeDream, see what the problem is and put it right. If you get this message on a BASIC program or any other coded file it has the same effect as the File Checksum Error message. See above. Whatever type of file this message appears for, something has gone seriously wrong and you have probably lost the file. Try and unsqueeze it again and start praying that you have got a back-up copy somewhere else. If you want filenames on your Z88 to be DOS compatible you can change all 12 character filenames with the Rename command. To do this, select the Filer (n F), then the Rename command (tRE). When you get the 'Name:' prompt type in these 'Wildcard' characters: '????????*'. This will display all filenames greater than eight characters long, so that you can give them new eight character names..
Whilst the MS-DOS version of Squeeze/Unsqueeze is not supplied with SQUEEZE it is available from Rakewell Ltd. as an additional program.